Have you got your Fuji Rock tickets yet? Here's some advice for preparing for and enjoying the festival. Hat. The peak will protect you from the sun and keep the rain out of your eyes. A waterproof one would be very practical if unfashionable. Light raincoat. This is essential because umbrellas are not allowed in the festival site and rain is extremely likely. Some people wear plastic rain pants too. I usually bring a couple of cheap rain ponchos as well. Strong shoes or boots. You will be doing a lot of walking. Bring spares. Don't bring your best ones because they will get full of mud. Although uncomfortable, wellingtons/gum boots are popular and make it a lot easier to walk around if there's a lot of mud. Bring some spare insoles. Sunglasses and sunscreen. You will be outside all day. Jacket. It sometimes gets cold at night, so bring something long-sleeved. Towels. Big towels for the shower, but also bring lots of small towels for mopping up sweat and rain, washing your face, protecting your neck from the sun, wiping the inside of your tent etc. Cash. There are no ATMs. Batteries. For your phone recharger, torch, camera etc. Portable ashtray. If you smoke. Tissues. Bring some little packs in case there's no loo paper, you get a runny nose or if you're a messy eater. Insulated plastic bottle cover. You can get them from a 100yen shop. Something to sit on. Small tarp, light fold-up chair, or even just a plastic bag. After it has been raining, it can be very difficult to find a dry place to rest your weary legs. Plastic zip-lock bags. To keep your phone, camera and wallet dry. Small backpack. Preferably waterproof, to carry your drinks and camera and things around the festival. First aid kit. Just bring some painkillers and band-aids. You can get many of these things from a 100yen shop. Torch/flashlight. The camp site is dark. Some parts of the festival are pretty dark too. A light you can hang in your tent will also be handy. Plastic covers. For your backpack and camping gear on the way to/from the festival. Otherwise, if it is raining while you're waiting for the bus or waiting for your wrist band, all your gear will get soaked. Plastic garbage bags. To keep your gear dry, for dirty clothes, sitting on and many other uses. Blue sheets (plastic tarps). These come in handy to put in front of your tent, to put your gear on the wet ground, makeshift shade etc. Umbrella. As explained above, this will help keep you and your stuff dry while queuing. You can bring it into the camp site but not the festival site. Insect repellent. You will be in the forest. Rope. This is very handy when camping to rig up a clothesline or to secure broken tents. Remember a knife to cut it with! Mallet or hammer. You can't bash in tent pegs with your bare hands. Extra tent pegs. Some of them always bend or get lost. Small padlock. Theft isn't really a problem, but if you're worried about leaving stuff in your tent/backpack, put a small lock on the zipper. Something to mark your tent. There are thousands and they all look the same, especially when you're drunk! Tape or a flag or something. Something to sleep on. Of course you will bring your sleeping bag to sleep in, but many people try to sleep directly on the ground. It can be hard and cold so at least bring a roll-up mat. Most alcoholic drinks in the festival grounds cost 600 yen. The beer is almost always Heineken but you can usually get some nice microbrewery and organic beer down around the Field of Heaven stage. Naeba Shokudo sells some good nihonshu (sake) and shochu. The Tokoro Tengoku/Cinema Fuji has some nice cocktails, fresh juice and cheap chu-hi. For real bars, go to Palace of Wonder or Cafe De Paris. Some cheap drinks and makeshift bars can usually be found near the festival entrance and the surrounding area. Glass bottles and cans are not allowed to be brought into the festival grounds and your bags will be checked each time you enter. But don't worry - alcohol is allowed to be brought in, so you can mix up drinks in plastic bottles in your tent/room and then carry them into the festival. Bring a cooler box/bag along to keep in your tent/room and get ice from the store near the front of the Prince Hotel. There are vending machines around the entrance which mainly only sell Pocari Sweat, water and Coca-cola so bring some spirits which you can mix with coke (vodka, bourbon, rum etc) or water (shochu, whisky etc). Food is a big part of the festival so you will find plenty of good choices. The biggest concentration of food stalls is the Oasis/World Restaurant area near the Red Marquee. You will also find clusters of them in front of the festival site, at Palace of Wonder, Gypsy Avalon, Orange Court and other spots. Most food is around 600yen. Good, simple and cheap Japanese food can be had at Naeba Shokudo. To see what food stalls will be at this year's festival, check Fes Gohan (in Japanese). Apparently the Thai stall called Amrita at Orange Court will have some vegetarian food this year and there will be a vegan stand called CORI at the Dog Wonderland area behind the Prince Hotel. In the Oasis area, you will find a stall selling pizza and pasta, and another selling onigiri (rice balls). At Naeba Shokudo you will find simple Japanese food. Ask them what they have without meat and fish. They should have a couple of things. In the world restaurant area, the Gan-ban bar has chips with salsa which might be vegetarian. At Tokoro Tengoku/Cinema Fuji you will find tokoroten and fresh juice, and possibly a vegetable burger if you're early. In the NGO Village at Avalon there should be some options like bagels from The Atomic Cafe stand. At Field of Heaven, a stall called Levain sells some interesting home made breads and there is also a good pizza stall called Sakuragumi. Big Cake at Orange Court has a vegetable curry that might be vegetarian. Otherwise, you could try your luck at other food stalls. They might be able to make something without meat. I always bring some food with me too. The festival site is an enormous ski resort in the mountains so expect to spend a lot of time walking, walking and walking. You'll need to study the timetable and factor in long walking times between stages on opposite ends of the festival. It can take up to half an hour. Remember that crowds, mud and walking in the dark can hold you up. The paths and boardwalks between stages take you through beautiful green forests so the walking is usually pleasant. The boardwalk can be a quick way to get between the Green Stage and Field of Heaven or Orange Court. It will also take a long time to walk into the festival from the camp site, nearby hotels and the bus stop. Bring your phone but don't rely on it too much as you often can't get reception at the festival site. Plan places and times to meet friends in advance. Bring a battery-operated phone recharger and a plastic bag to keep your phone dry. You can get stuff sent to and from the festival by Yamato at reasonable prices. There is a counter near the entrance where you can pack and post stuff. This is very useful if you're too tired to carry all your stuff home. The Yamato counter can also store your luggage throughout the festival. It took me a couple of years before I realised there was a small shop in front of the Price Hotel selling drinks, snack food, instant ramen, a little bit of camping equipment and other bits and pieces. Of course some of the prices are inflated. This can also be a good place to shelter from the rain and use real toilets. In the Oasis food area there is an information centre that you can go to if you lose anything, have any problems, need first aid etc. Nearby there is also a notice board where they will post any changes to the schedule and people can leave messages for each other. Fujirockers also has a tent around here where you can use the Internet. The big name acts will be on the Green Stage, White Stage, Red Marquee, Orange Court and Field of Heaven but make sure you check out some of the other stages and areas of the site too. Mokudo-tei is a tiny stage set up on the boardwalk in the middle of the forest where bands play intimate sets. Day Dreaming/Silent Breeze is a 20-minute cable-car ride away up on top of a mountain. Some cool hip-hop and electronica acts play up there, there are weird games and costumes, a flying fox, a restaurant, dragonflies and a really fun relaxed atmosphere where you are allowed to act like children. Naeba Shokudo is near the world food area/Red Marquee. You can sit undercover on the tatami, get some nice Japanese food and sake, as well as catch some performers on the small stage. The Crystal Palace tent/Palace of Wonder area is a bizarre place near the festival entrance where you can have some all-night fun. Dance, play, have some cocktails and watch the Invisible Wall of Death. Check out some up-and-coming bands late at night on the Rookie A Go-Go stage. If you have time, go right down to the very end of the festival beyond the Orange Court to Cafe De Paris tent. You can get some good cocktails, cool down your feet in the creek, and jam on the drums at Stoned Circle. There are hammocks you can use in the forest at the back between the Gypsy Avalon stage and NGO area. Take a look at the NGO booths while you're there and catch a performance on the Gypsy Avalon stage. Ganban has a small stage near the World Restaurant area where DJs play. This is a fun and casual area to dance late at night. Cinema Fuji is a cool area to hang out and watch some late night films or buskers. There are also some good cocktails, juice and food here at Tokoro Tegoku. You can cool your feet in the creek here too. It's past Kids Land, between the Green and White stages. There are also a couple of new areas behind the Prince Hotel called Pyramid Garden and Moon Caravan open only to campers. The kick-off party on Thursday night is highly recommended. It's free to the public so some locals come and hold a bon-odori (traditional dance) and fireworks. Surprise bands and DJs play on the Red Marquee and Ganban stages while everyone gets hyped up and ready for the festival. 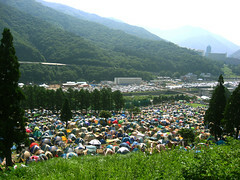 The campsite covers a large golf course and surrounding area on the front left of the festival site. Unfortunately, most of it is hilly so flat land is at a premium. It must be a ridiculously difficult golf course! The earlier you can get there, the better. Definitely try to arrive on Thursday when it opens if you can. All the best spots gets snapped up on Thursday. For women, there is a girls-only area in a great spot near the entrance. 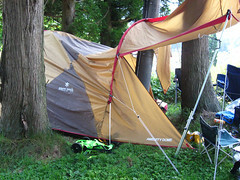 The ideal place to pitch your tent is on flat ground (seriously! You will see some tents on crazy angles), not too far from (or close to) the entrance, not at the bottom of a hill as the lower areas get flooded and muddy, near (but not too close to!) toilets, ideally near some trees for shade and to use as a post for a clothesline (but you're not supposed to do this), and not right next to the path (unless you want people falling on and kicking mud on your tent). At the entrance to the camp site there is a camping service station. The staff there can help you if you have trouble pitching your tent and other things. There is also a BBQ area here for campers who bring their own food. You are not supposed to use fire or barbeques in the camp site. There are some showers and onsen (hot spring bath) you can use near the camp site entrance. Expect long queues and no privacy. Around the camp site there are some toilets which have sinks next to them that you can use to wash up. A tent with a shaded entrance is ideal so you can escape from the hot tent, sun and rain during the mornings. A fly for your tent will help you keep dry. If you buy a different ticket, you can camp in another camping area called Pyramid Garden. It is a flat, grassy area with its own stage. Before you go to the festival, good place to find cheap camping and outdoor gear is at a 'home centre' (big DIY/furniture shops) like Simachu, Cainz, Komeri etc or cheap department store type places like Don Quixote or Olympic. You can find good quality stuff at outdoor stores like L-Breath. Amazon.co.jp has a big range of outdoor gear too. Most people take the shinkansen from Tokyo or Ueno station. You need to get off at Echigo-Yuzawa station. It takes just over an hour and costs 6490yen from Tokyo or 6290yen from Ueno one-way. You can get tickets from the JR counter of any major JR station. You could get the return tickets in advance as well, or just get them when you get to Echigo Yuzawa. Check train times at Hyperdia. Local trains cost about half the price of a shinkansen (3260yen), but take more than twice the time. Get the JR Takasaki line from Ueno to Takasaki, then the JR Joetsu line to Minakami, then the infrequent Joetsu line extension to Echigo-Yuzawa. Check train times at Hyperdia. A seishun juhachi kippu is even cheaper. This ticket gives you five daily coupons of unlimited travel on JR local and rapid trains (not express or shinkansen) between July 20 and September 10 for only 11500yen. You can divide the 5 tickets among your friends and it'll work out to be only 2300yen to get to the festival! You will need to travel together. Even if there are only two of you, if you use it on the way there and back, it'll only cost you 2875yen each way. You can take the above local train route. The seishun juhachi kippu is available at the ticket counters of most major JR stations. You can of course drive there. A car rental agency with English support is Nippon Rent-A-Car. Free shuttle buses run to and from Echigo Yuzawa station from 12:00 on Thursday to Monday. There is no real timetable; they just keep going back and forth. Be prepared for long queues in the sun or rain. The free buses also stop at Tashiro, Mitsumata and Asagai if your accommodation is around there. Don't worry if you don't have your festival ticket yet, the driver won't check. 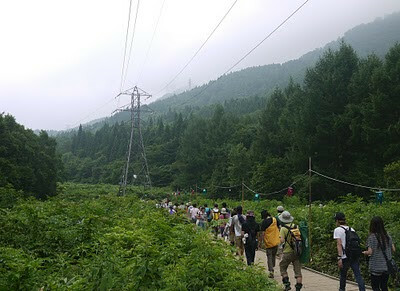 You could get a taxi from Echigo-Yuzawa station to the site if you are in group of three or four, or if you are rich. It will probably cost around 6000yen.